O C T O B E R 2 0 1 7 • O U T PA T I E N TS U R G E R Y. N E T • 2 9 Don't leave dirty dishes in the break room sink. 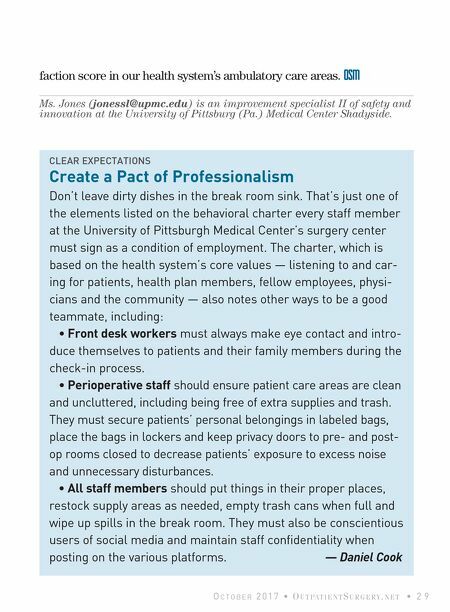 That's just one of the elements listed on the behavioral charter every staff member at the University of Pittsburgh Medical Center's surgery center must sign as a condition of employment. 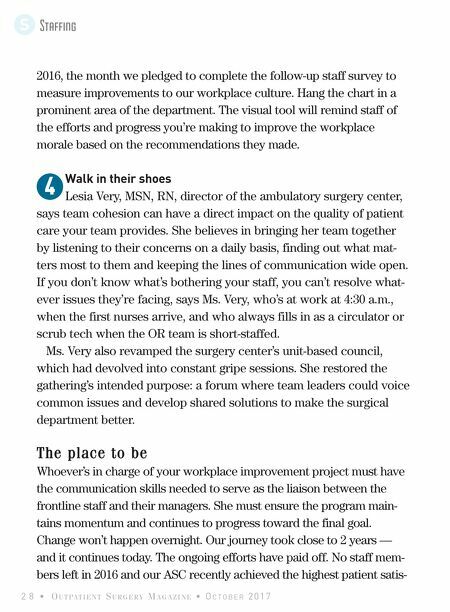 The charter, which is based on the health system's core values — listening to and car- ing for patients, health plan members, fellow employees, physi- cians and the community — also notes other ways to be a good teammate, including: • Front desk workers must always make eye contact and intro- duce themselves to patients and their family members during the check-in process. • Perioperative staff should ensure patient care areas are clean and uncluttered, including being free of extra supplies and trash. They must secure patients' personal belongings in labeled bags, place the bags in lockers and keep privacy doors to pre- and post- op rooms closed to decrease patients' exposure to excess noise and unnecessary disturbances. • All staff members should put things in their proper places, restock supply areas as needed, empty trash cans when full and wipe up spills in the break room. They must also be conscientious users of social media and maintain staff confidentiality when posting on the various platforms. — Daniel Cook CLEAR EXPECTATIONS Create a Pact of Professionalism faction score in our health system's ambulatory care areas. OSM Ms. Jones (jonessl@upmc.edu) is an improvement specialist II of safety and innovation at the University of Pittsburg (Pa.) Medical Center Shadyside.